If you’re like me and love to have a look at a show home, this post is for you! I’ve just discovered the Newbury Racecourse development in Berkshire, by David Wilson Homes. These show homes have been expertly designed and I knew I had to share it with you all! Newbury is a small town in West Berkshire, a short distance from Reading, Oxford and Basingstoke. A short distance away from the M4 means accessing London and the South West by car is easy. You can also hop on a train from Newbury Station and arrive in London Paddington in an hour. The town may be small, but it’s a vibrant mix of places to shop, eat and much more. Attractions include the West Berkshire Museum, Highclere Castle (one for all you Downton Abbey fans) and one of the most popular out of them all, Newbury Racecourse. 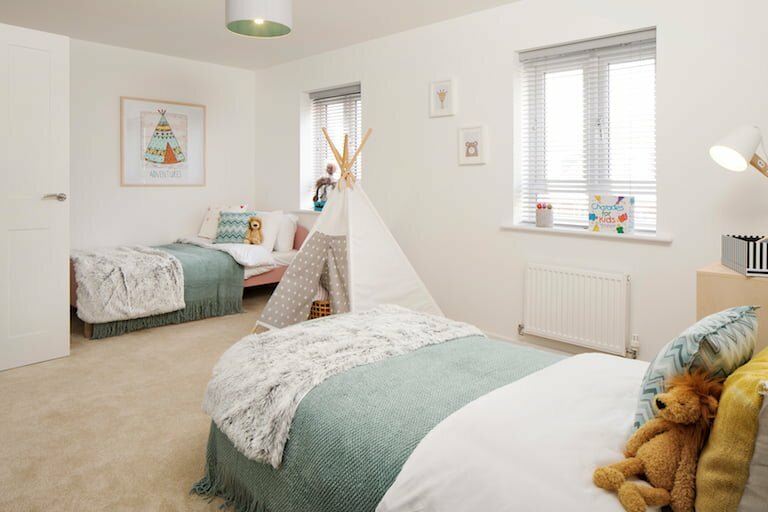 The Newbury Racecourse development is a little gem of quality homes. Dotted throughout the development is a mix of two to five bedroom homes. I love the little racing elements dotted throughout the development including street names such as “Home straight” and green areas named “Leap”. Greenery throughout this development adds to the countryside feeling with open spaces surrounding the development and racecourse. By visiting a show home, you will always discover elements of the interior design that you can take inspiration from. Plus, it’s nice to see it in real life compared to on the screen. The Hinton and Houghton style homes are packed full of interior inspiration. These two types of homes offer spacious rooms and are kept minimal, but look comfy. Great inspiration if you’re renting! With a contemporary chic style, the Houghton has been designed with complete elegance throughout. It features a neutral colour palette of cream paired with different shades of blue. By using a neutral colour palette, you can easily update with different colours throughout the seasons. I love the use of subtle metallics and copper throughout this style. The Hinton takes many design cues from nature. With a simple colour palette of green and quality accessories dotted around, this can easily be recreated at home. There are even a few inclusions of the ever popular botanical theme. Long gone are the days of show homes looking very structured and rigid! What ideas do you think you’ll steal from these show homes? Let me know in the comments below. Plus, let me know what you think of this post and if you want more posts showcasing upcoming developments for both buying and renting.